Auctions will resume on July 26. 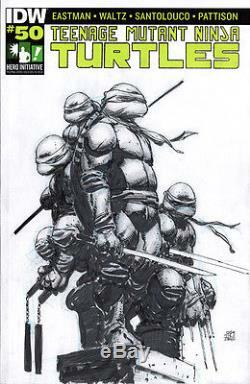 IDW Publishing and Kevin Eastman graciously created blank-covered editions of the landmark Teenage Mutant Ninja Turtles #50 and gave them to The Hero Initiative to have stellar artists do ORIGINAL drawings on the cover. Each of these covers is an original, one-of-a-kind piece! Hero will be auctioning these off at the rate of 10 per week til we get thru all covers available! The CGC label will not only state the grade, but it will say who drew and signed the comic, the date that it was signed, that it was signed for the Hero Initiative, and all pertinent key and art comments. Please hit view sellers other items to see other Hero Initiative Teenage Mutant Ninja Turtles #50s being auctioned right now! And heydont bother asking, Can you tell me when the Joe Artist cover will be auctioned? Were making it up as we go along. Just check back every week for a new batch! And in the meantime, you can view ALL of the covers at the Hero Initiative website. The Hero Initiative is the first-ever federally chartered not-for-profit corporation dedicated strictly to helping comic book creators in need. The Hero Initiative creates a financial safety net for yesterdays' creators who may need emergency medical aid, financial support for essentials of life, and entrée back into paying work. The item "Hero Initiative Teenage Mutant Ninja Turtles 100 Project cover KHOI PHAM" is in sale since Tuesday, July 12, 2016. This item is in the category "Collectibles\Comics\Original Comic Art\Covers". The seller is "heroinitiative" and is located in Los Angeles, California. This item can be shipped to United States, to Canada, to United Kingdom, DK, RO, SK, BG, CZ, FI, HU, LV, LT, MT, EE, to Australia, GR, PT, CY, SI, to Japan, to China, SE, KR, ID, to Taiwan, ZA, TH, to Belgium, to France, to Hong Kong, to Ireland, to Netherlands, PL, to Spain, to Italy, to Germany, to Austria, RU, IL, to Mexico, to New Zealand, SG, to Switzerland, NO, SA, UA, AE, QA, KW, BH, HR, MY, BR, CL, CO, CR, PA, TT, GT, SV, HN, JM.